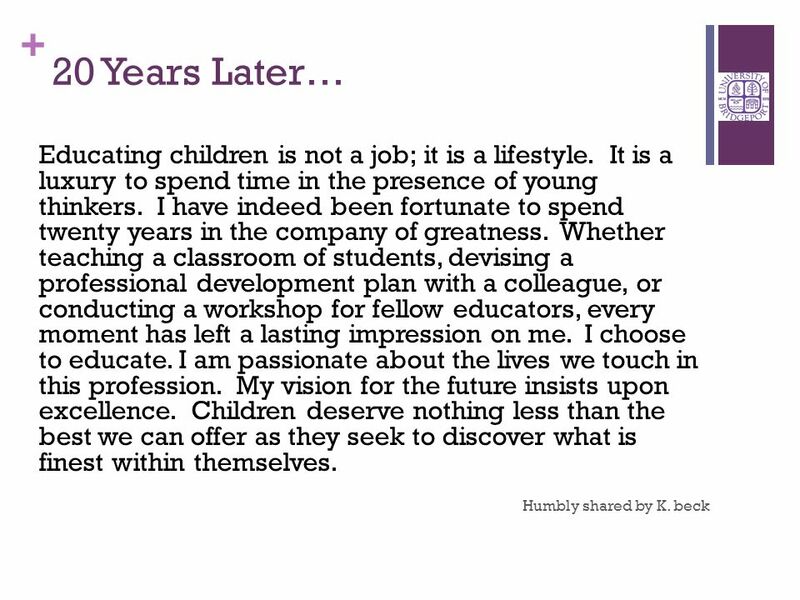 + Professionalism and School Culture Pre-Service Teacher Training January 4, 2013 Kimberly A. Beck. 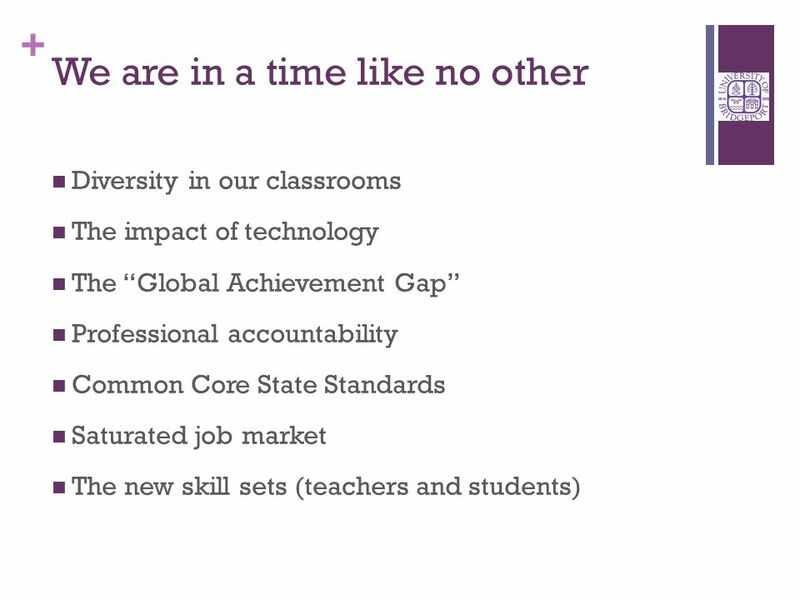 4 + What does school look like? 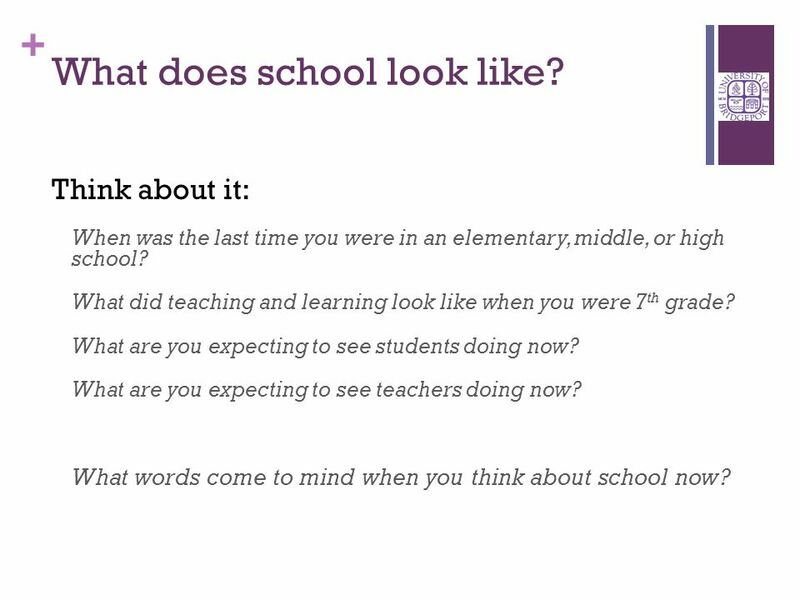 Think about it: When was the last time you were in an elementary, middle, or high school? 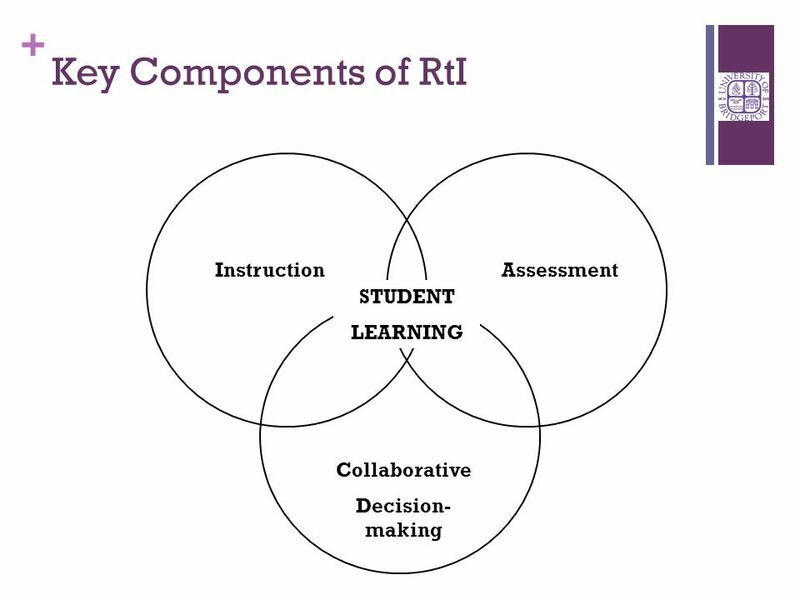 What did teaching and learning look like when you were 7 th grade? 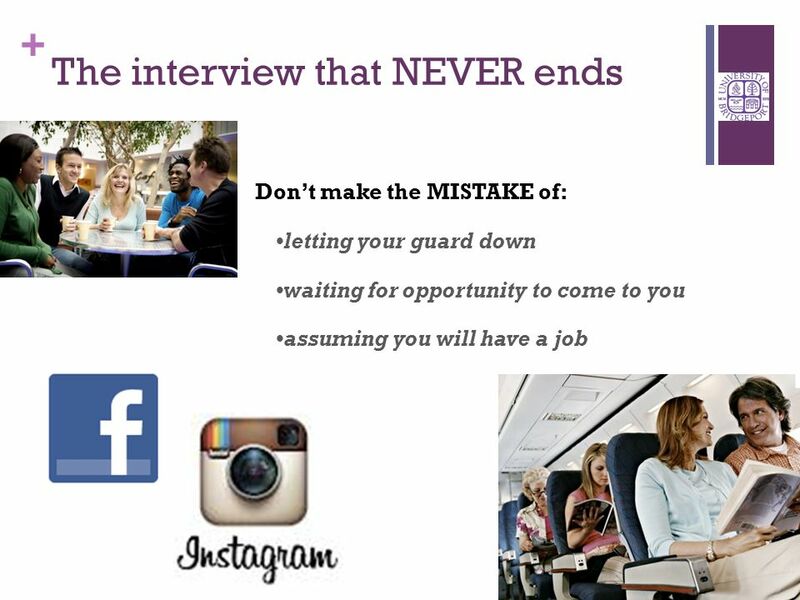 What are you expecting to see students doing now? 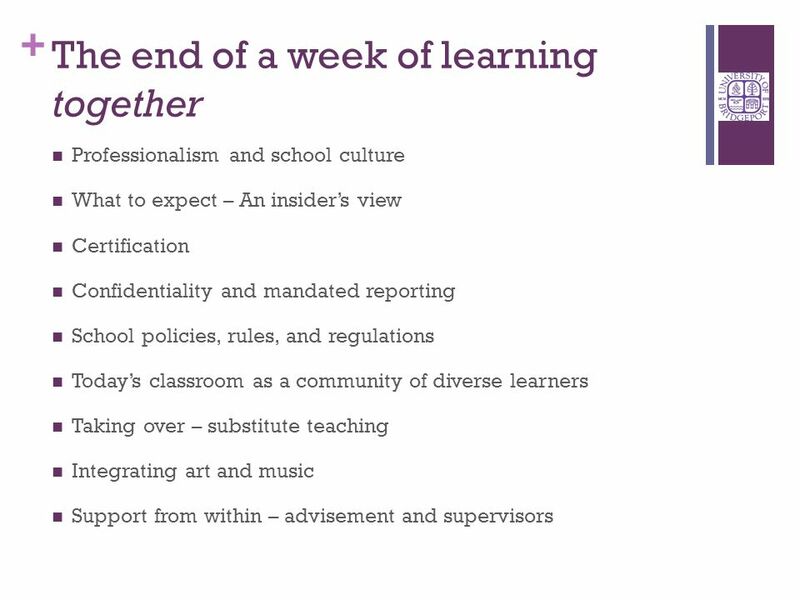 What are you expecting to see teachers doing now? What words come to mind when you think about school now? 7 + Get ready! 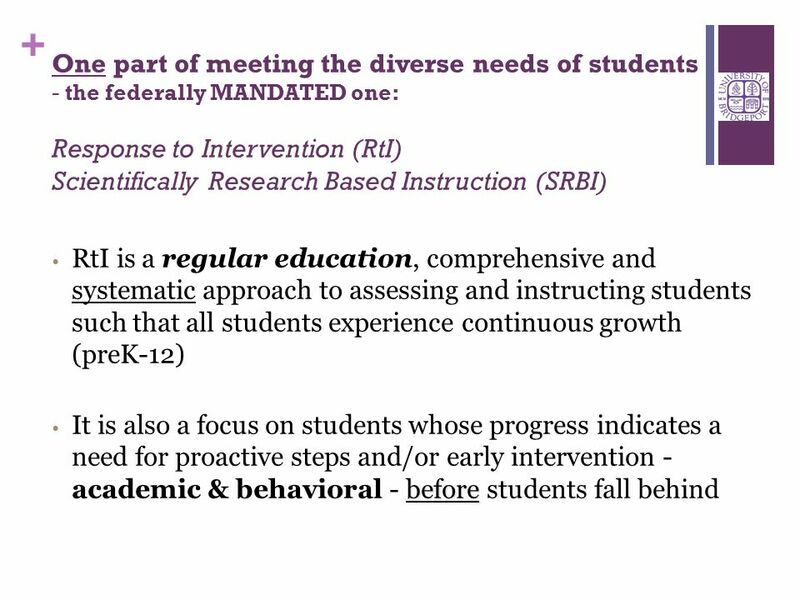 This is likely the most challenging and exciting time in the history of American education and YOU are going to be part of it! 9 + XTRANORMAL Do NOT underestimate the importance of LOOKING the PART! 10 + Playing the role Know your lines – a.k.a. 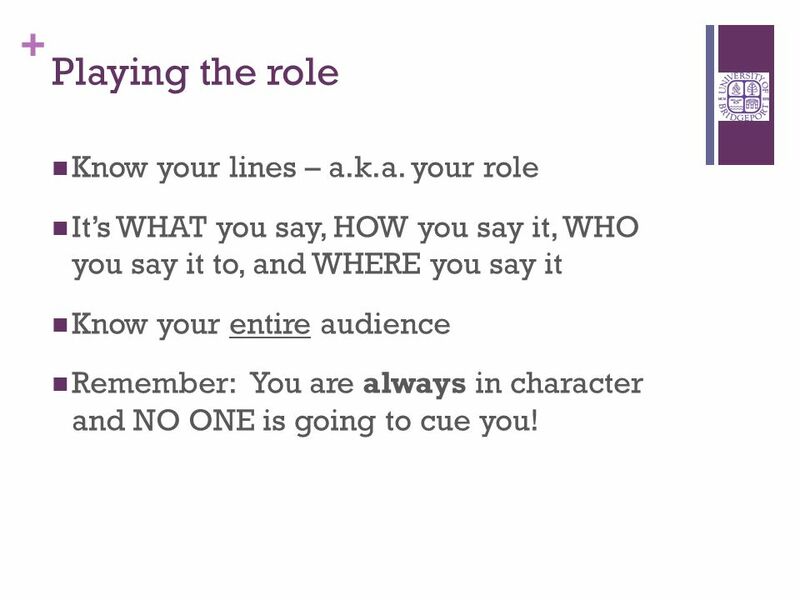 your role Its WHAT you say, HOW you say it, WHO you say it to, and WHERE you say it Know your entire audience Remember: You are always in character and NO ONE is going to cue you! 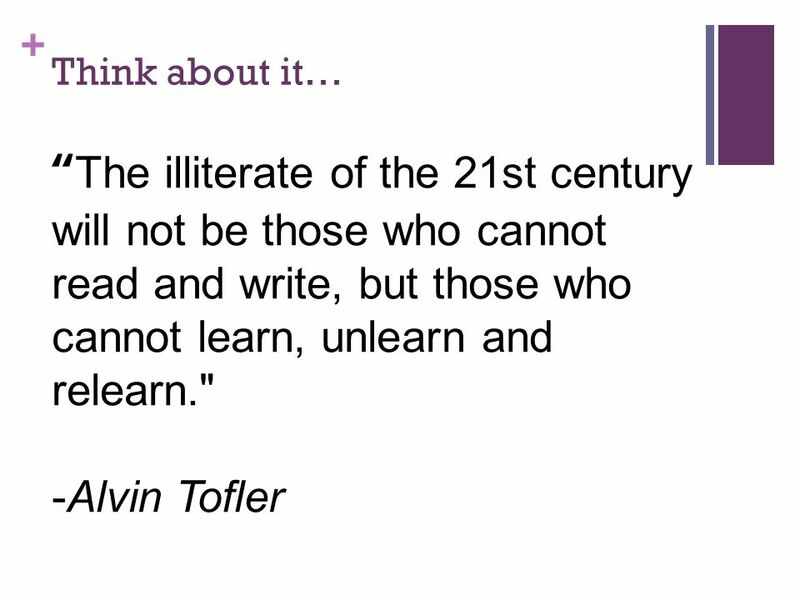 12 + What does it REALLY mean to be a teacher in the 21 st Century? Prepare yourselves…this is BIG. 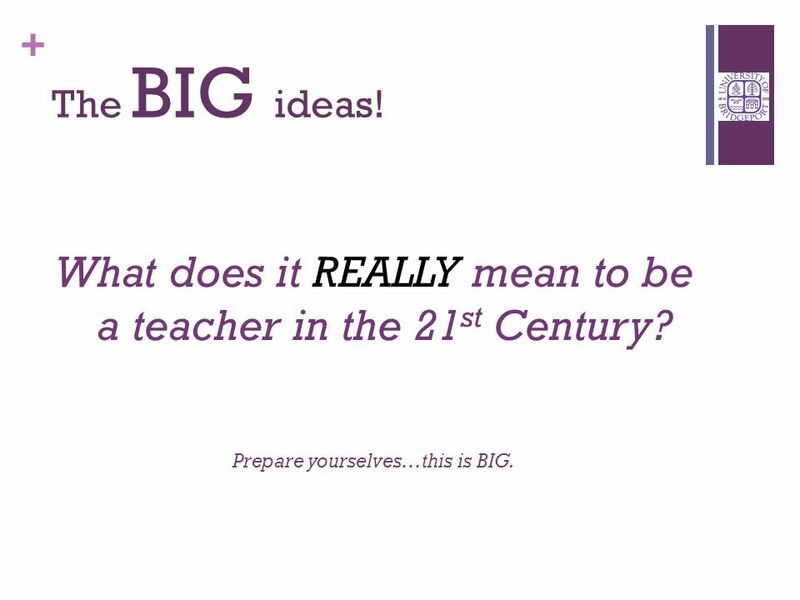 The BIG ideas! 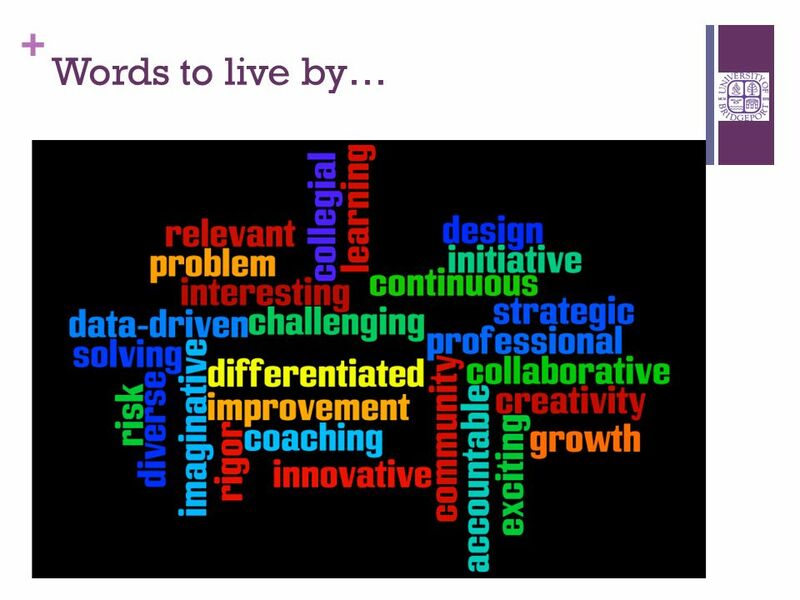 13 + What do you think of when you hear the word DIVERSITY? 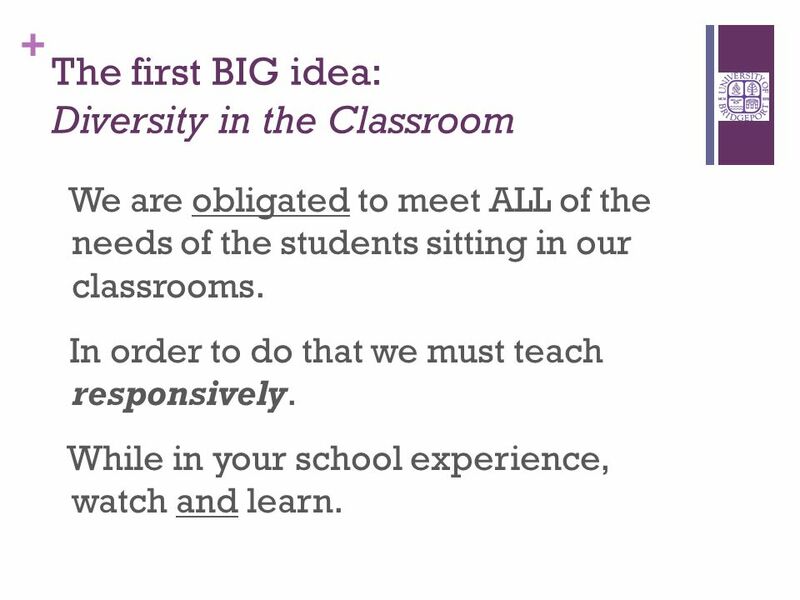 14 + The first BIG idea: Diversity in the Classroom We are obligated to meet ALL of the needs of the students sitting in our classrooms. 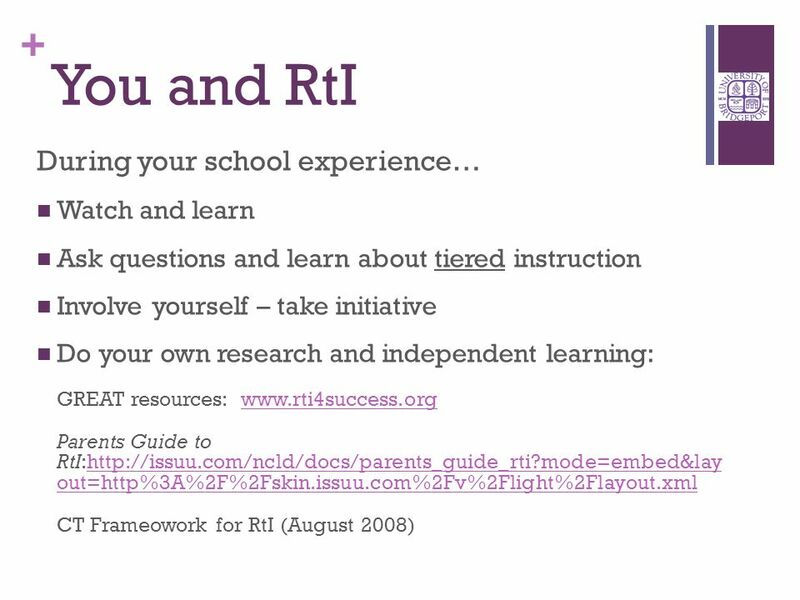 In order to do that we must teach responsively. 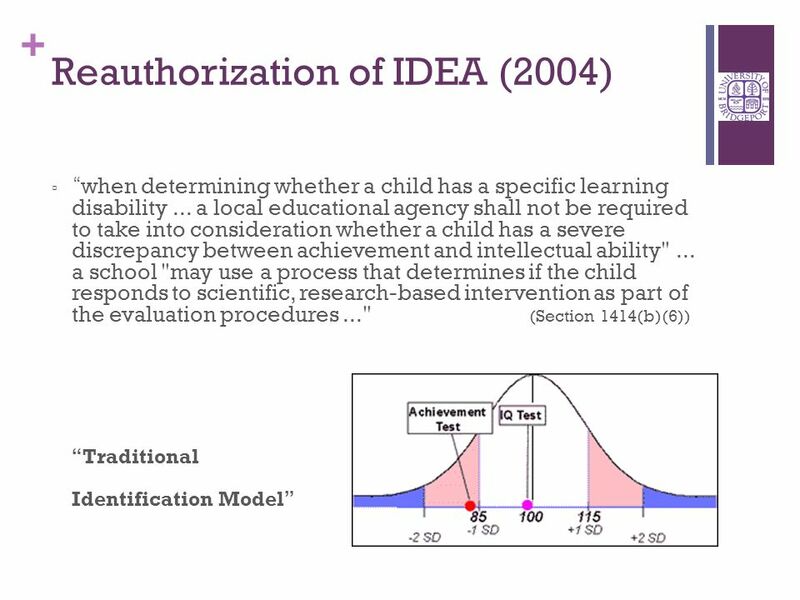 While in your school experience, watch and learn. 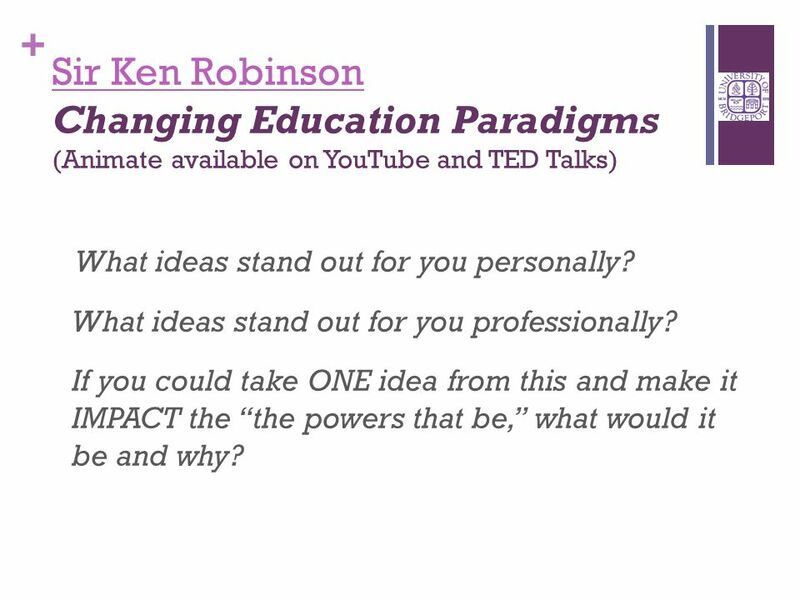 22 + Sir Ken Robinson Sir Ken Robinson Changing Education Paradigms (Animate available on YouTube and TED Talks) What ideas stand out for you personally? 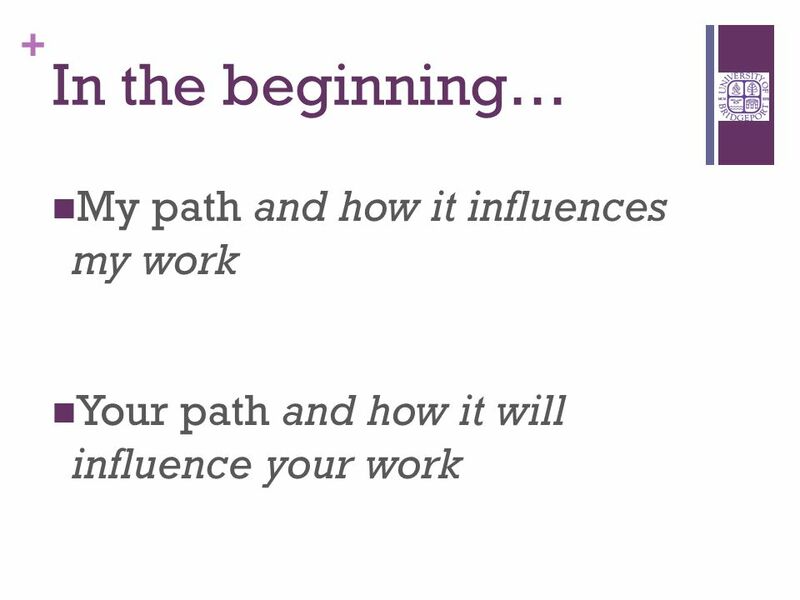 What ideas stand out for you professionally? If you could take ONE idea from this and make it IMPACT the the powers that be, what would it be and why? 24 + Did you notice? 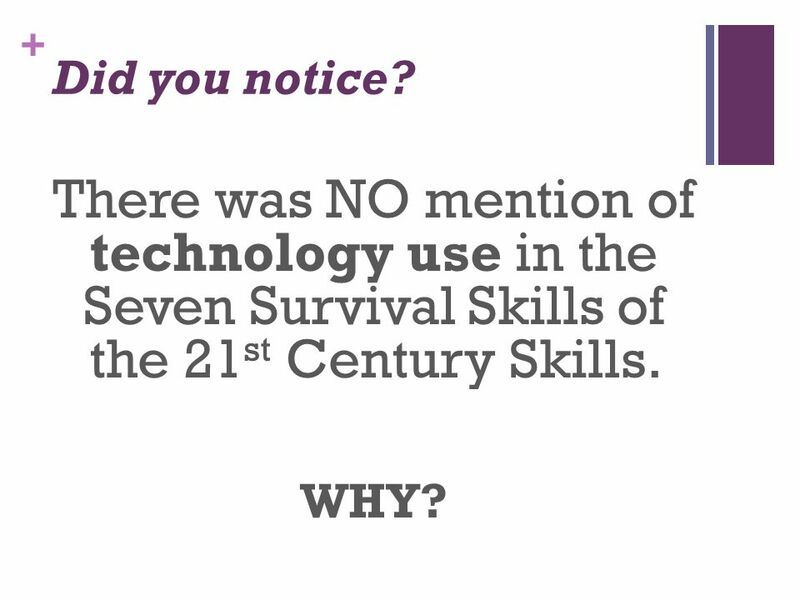 There was NO mention of technology use in the Seven Survival Skills of the 21 st Century Skills. WHY? 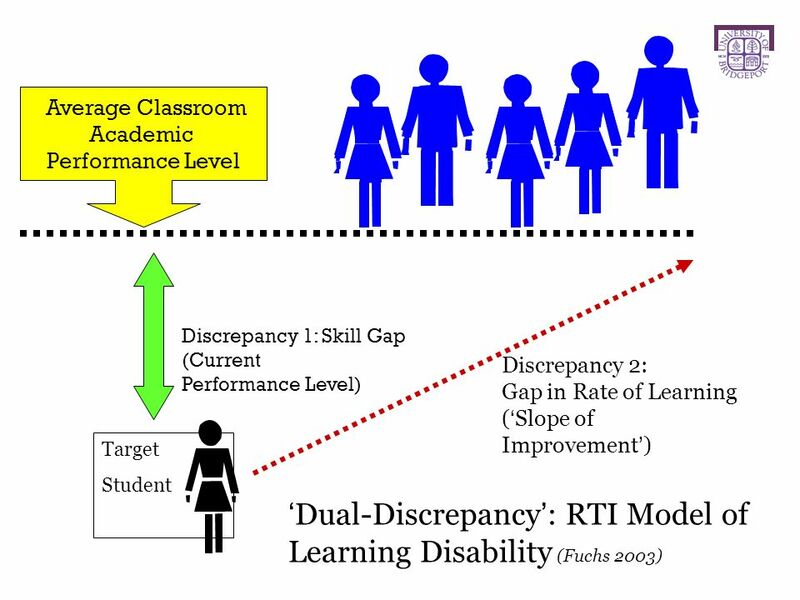 25 + The BIG idea of Accountability - YOU will be held accountable… Most importantly, by your STUDENTS and their families However, the game is changing. 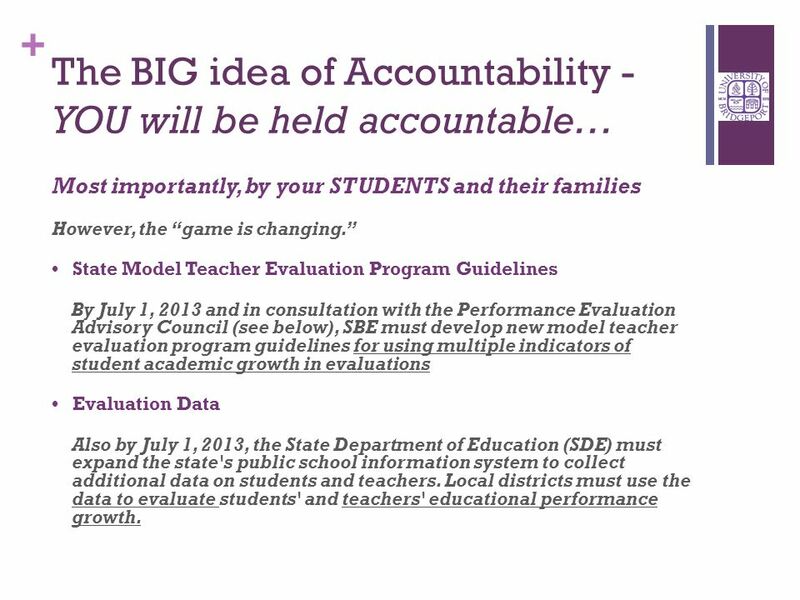 State Model Teacher Evaluation Program Guidelines By July 1, 2013 and in consultation with the Performance Evaluation Advisory Council (see below), SBE must develop new model teacher evaluation program guidelines for using multiple indicators of student academic growth in evaluations Evaluation Data Also by July 1, 2013, the State Department of Education (SDE) must expand the state's public school information system to collect additional data on students and teachers. 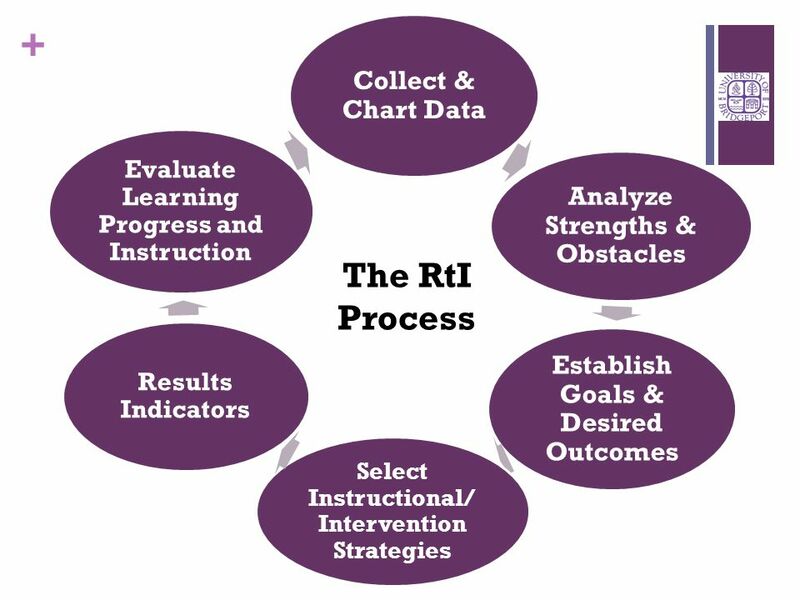 Local districts must use the data to evaluate students' and teachers' educational performance growth. 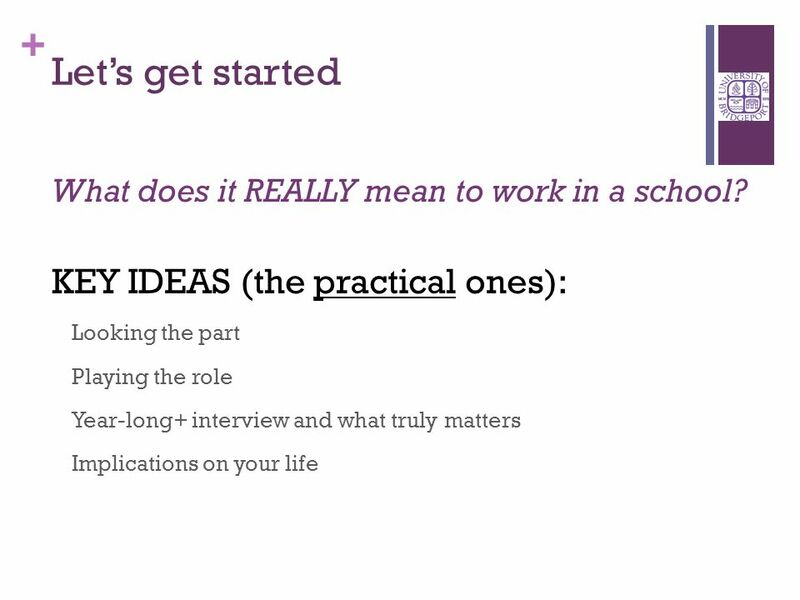 28 + Practicality and the BIG Ideas Think about your upcoming role: What comes to mind? How do you feel right now, really feel? What are you excited about? What are nervous about? 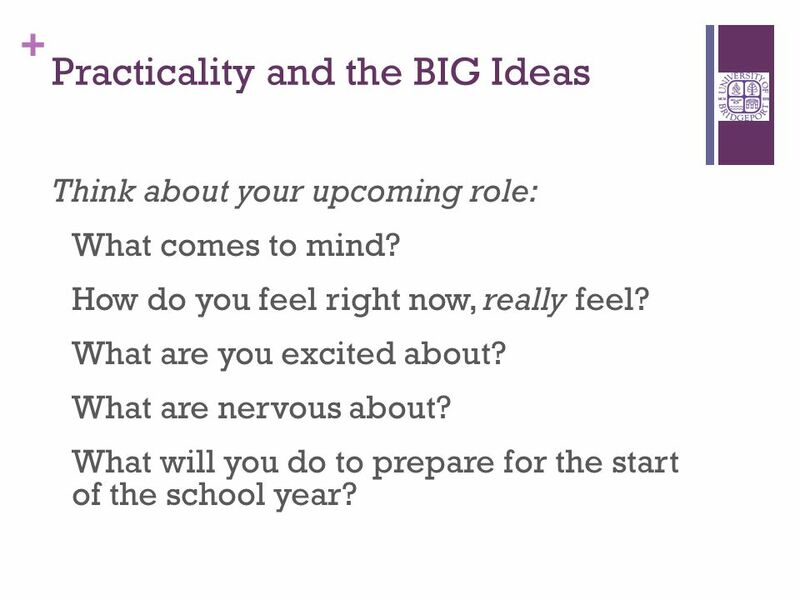 What will you do to prepare for the start of the school year? 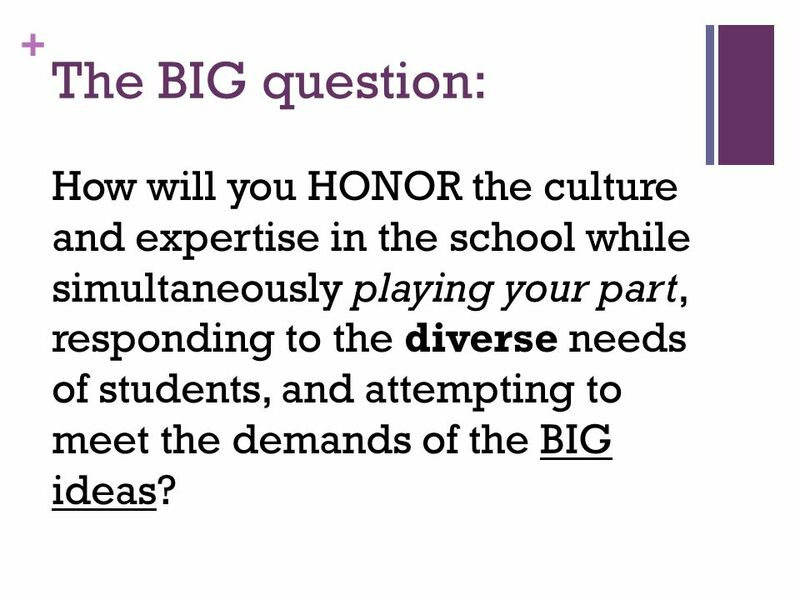 29 + The BIG question: How will you HONOR the culture and expertise in the school while simultaneously playing your part, responding to the diverse needs of students, and attempting to meet the demands of the BIG ideas? 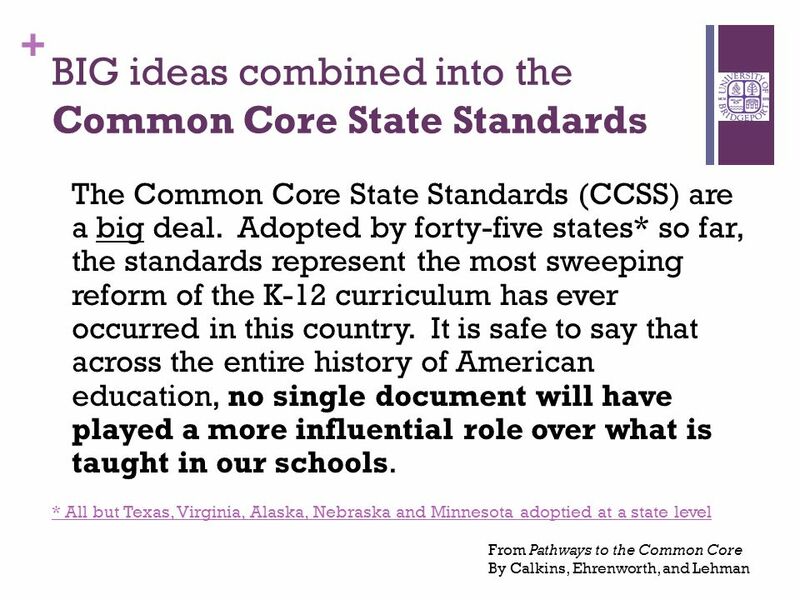 32 + This is likely the most challenging and exciting time in the history of American education and YOU are going to be part of it! 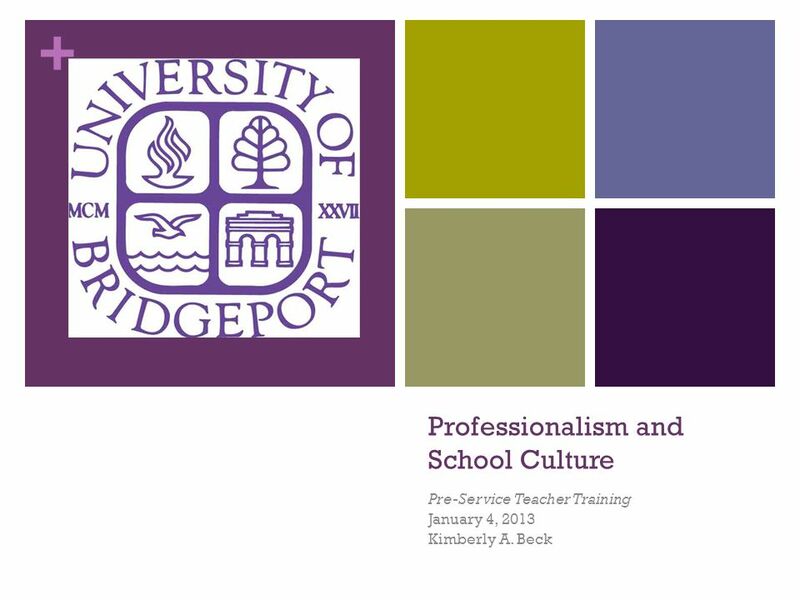 Download ppt "+ Professionalism and School Culture Pre-Service Teacher Training January 4, 2013 Kimberly A. Beck." 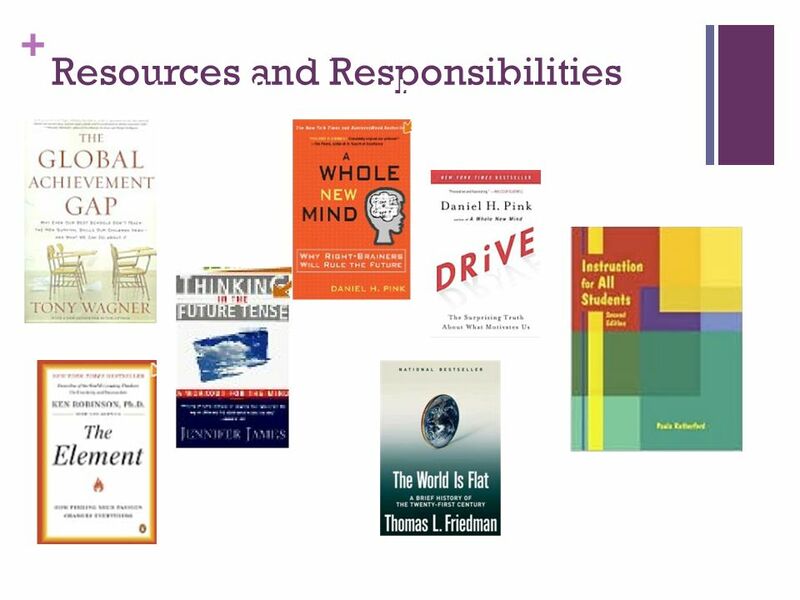 Todays presentation slides will be available at under the Resources Section Thanks for supporting ISBEs quest to Go Green. Gifted Education and Response to Intervention Update on Gifted Education Workshop August 2013 Toddie Adams, Marshall County Schools. Evidence, Ethics, and the Law Ronnie Detrich Wing Institute. A New Vision for 21 st Century Education [Insert Presenter Name] [Insert Presenter Title & Company] [Insert Event Name] [Insert Date] PLEASE NOTE: This. ELM Parent Orientation d e s i g n. f a c i l i t a t e. c o a c h. l e a d. t r a n s f o r m. Add school logo. 1 Visions of Community 2011 March 12, 2011 The Massachusetts Tiered System of Support Madeline Levine - Shawn Connelly.